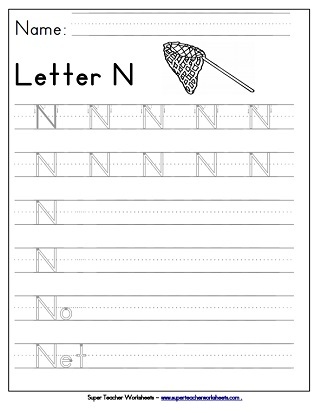 Write the letter N on the primary lines and then color in the pictures of the nest and nail. This nice headband has pictures of a nest, nail, and a nose. Practice writing N n on the primary lines. 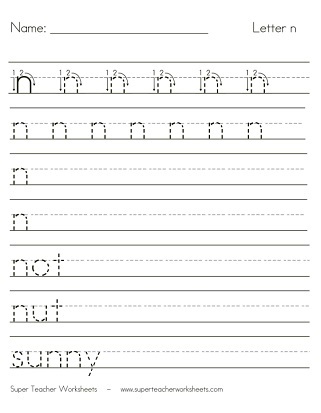 Trace along the dotted lines to practice writing lower-case n.
Use this worksheet to practice writing lower-case n.
Use a pencil to trace along the dotted lines to practice writing capital N.
This is another printable worksheet to practice writing capital N.
Time to review the letter N n. Draw upper and lower case letter n.
Dab the circles in the shape of letter N on this worksheet.